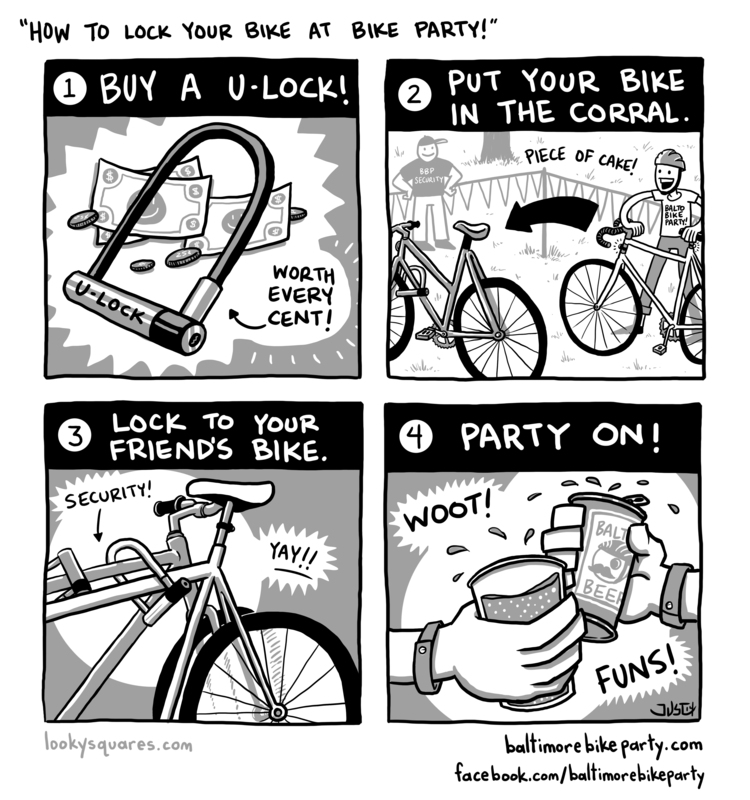 How to Lock Your Bike at Bike Party! Hey Bike Partiers! Another IMPORTANT message here! As most of us know, Bike Party has become a target for those looking to steal bikes. While there is no excuse for this behavior, there are a couple easy things ALL of us can do that will GREATLY reduce the amount of theft at Bike Party. As long as we continue to create an EASY TARGET, Bike Party will continue to be plagued by theft. We often spend over $1000 each month on security and/or police. However, hundreds of bikes continue to be locked OUTSIDE the party grounds, often around a corner or down the block, outside the visibility of our security. Just as often, these bikes are “secured” with inferior locks, easily cut within seconds by a sharp pair of cutters. 1) BUY A U-LOCK. And not the cheapest U-lock. A bike-specific hardened chain will also work, but is bulkier and heavier. NO CABLE IS SAFE, no matter how thick. 2) LOCK YOUR BIKE IN THE PARTY. During every outdoor after party, we strive to provide a secure bike corral, roped off, often with racks, and ALWAYS patrolled by security. Even if you can’t get your bike in the corral, having it IN THE PARTY GROUNDS means that our security will be able to keep their eyes on it, and definitely know if someone tries to take it. 3) LOCK YOUR BIKE TO YOUR FRIENDS’ BIKE(S). The purpose of locking a bike is to make it immobile. This does NOT mean it has to be locked to a pole, fence, wall, etc. There will never be enough “rack-like” items for 1500 people to lock to. Within the event grounds (or even better, the corral), lock your bike to your friend’s bike. Locking 2 or more bikes together effectively immobilizes them. No one can roll them away, no one can ride off on them. If anyone tries to walk off with a pile of locked bikes, it will be very clear to our security and everyone else. 4) PARTY ON! Go have a good time. Trust us, for those who have followed these simple rules, we have yet to hear of a single incident of bike theft. To help you remember these 4 steps, we have attached a handy-dandy comic strip! If we, as a group, begin locking our bikes in a more secure fashion, Bike Party will cease to be an easy target and those looking to steal bikes will likely head elsewhere. Remember, you can’t control the actions of anyone else, only your own. So let’s be smart, be safe, and have a blast! See y’all on Halloween!